Ellen Hutson LLC: Special savings of 10%, 20%, 30% and 40% on over 500 specially discounted items throughout the store ... check out the Black Friday section! JustRite Stampers: 20% off everything in the store (excluding the new November Release), including an additional 20% off the Super Sale section. Taylored Expressions: 15% off everything in the store, use promotional code TEBlackFriday upon checkout to receive the discount. And at 8am CST today, be sure to check the Taylored Expressions blog for a fabulous announcement pertaining to the annual Craft & Hobby Show in Anaheim, CA this January! Have fun shopping ... I'm sure you'll be having MUCH more fun doing that than I will be having at the dentist, LOL! Here is the set of cards inside that great Perfect Package Card Box (one post below this one) from Taylored Expressions -- a quick set of all occasion cards, using this week's Weekend Sketch Challenge #108 and JustRite Stampers Just A Note Centers & Borders -- this sketch was perfect for it! By keeping the same format and just changing the sentiment element and patterned papers, I had a very quick and easy set of cards for a Christmas gift! These same JustRite centers and borders are also offered in a Custom Design Cardmaking Kit, which includes the 1-5/8" Round Wood Stamper and Times New Roman Font Set (which I used to spell out CARDS on the box) ... if you don't already have them yourself, or they make a perfect Christmas gift, to get anyone started on their way to making their own greeting cards! With TEN different centers and borders in this cardmaking kit, you'll have every card giving occasion covered! I stamped the different borders with Memento Rose Bud ink onto TE Choice Buttercream cardstock and punched them out with a 1.75" circle punch. Then I stamped the center sentiments separately with Memento Rich Cocoa ink and punched those out with a 1.25" circle punch. The center is popped up on foam tape and both circles are layered onto a 2" square piece of Suede Brown Medium cardstock. I varied the patterned papers, which all coordinated with the base layer of Prism Rose Dark cardstock, and then placed pink velvet or magenta sheer ribbon over the seam where the cardstock meets the patterned paper. A tied button finishes off the design. Full details about the box can be found on THIS post. In honor of the Thanksgiving holiday, JustRite Stampers wants to say a big thanks to YOU and they are running a huge sale that will help Santa fill your stocking with JustRite toys! JustRite Black Friday/Cyber Monday Promotion: The sale is gong on NOW and will run through Cyber Monday, November 30. 20% OFF EVERY ITEM IN THEIR COLLECTION, except for the latest November release. Visit the Super Sale Section and receive an ADDITIONAL 20% off the current sale price for this 5-day promotion! I hope you'll check out the samples the rest of the sketch team have for you today, by visiting these wonderful ladies: Beate, Cambria, Charmaine, Jenn, Laurie, Lori and Mary Jo. Enjoy your weekend and we hope you'll play along with the sketch! I'll be decorating the house for Christmas ... how about you?!! EDITED: It seems my commenting was acting up earlier today, but it should be working properly now. Thanks to everyone who was kind enough to email and let me know! In honor of Black Friday and Cyber Monday (two of the biggest shopping days of the year!) Taylored Expressions is offering 15% off EVERYTHING in the store today through Monday, so you don't want to miss saving on some great GIFTS for others, supplies to help YOU make gifts, or just a little shopping for YOURSELF!! Just use promotional code TEBlackFriday upon checkout to receive the discount. You also won't want to miss 50% off all JustRite products, buy 2 get one free on Tiny Twinkles, and the new TE shirts and aprons! One featured item in the store is this great Perfect Package Card Box. It ships to you plain white and flat (pops open easily), ready for whatever kind of decorating you'd like to give it. I decided to make mine to hold an all-occasion card set for my Mom as a Christmas gift, so I decorated it "every day'ish", so it would be pretty sitting out on her desk or counter. To cover my box, I used Taylored Expressions' November Key Ingredients Kit with yummy Basic Grey Indian Summer patterned paper and Prism cardstock, adhered with my favorite Zip Dry glue. I used wine rick-rack and pink velvet ribbon from the kit and layered them together across the top of the box, where a seam in my papers met. To finish off the side edges of the box, which has a glossy finsish, I colored it with Copic Sketch marker R39, which matches the cardstock. A normal dye-based marker would not have dried on the glossy surface and just rubbed off, but Copic's alcohol-based ink dries instantly! The "CARDS" tag was made with JustRite Stamper's Times New Roman font, 50-point, and stamped with Memento Rose Bud ink onto TE Choice Buttercream cardstock and die cut with Spellbinders Double-Ended Tag die. That was layered onto Spellbinders Fancy Tag die cut from Prism Rose Dark cardstock and then a Petite Classic Oval die cut (also from Rose Dark cardstock) was layerd behind that! Zva pink crystals finish off the tag. I covered the inside of the box lid and sides with more Prism Rose Dark cardstock and then made a pocket out of cardstock, popped up on foam tape, to hold postage. This box is sized specifically for standard A2-sized cards and will hold approximately 8 to 12 of them, depending on embellishments. You can see the set of cards that I made for the inside of my box, by checking out my next blog post at 8:30am CST this morning -- they use Beate's Weekend Sketch Challenge #108! Sharon Harnist: http://paperfections.typepad.com/ <==YOU ARE HERE! I'll see you back here in a bit ... have fun hopping! EDITED: It seems my commenting was acting up earlier today, but it should be working properly now. Thanks to everyone who was kind enough to email and let me know! You can now see my set of cards HERE! A very happy Thanksgiving holiday to all my US friends out there! Since today officially begins the holiday season (can you believe it's here already?!! ), I thought I'd share a holiday decoration I made for my home. You can find all the details on how to create this door hanger/wall hanging over at the CLASSroom today. While you are there, be sure to check out the post directly below mine, for a holiday treat for yourself! Ms. Ellen has a special store 3rd anniversary blog giveaway going on and you won't want to miss it! Also, you'll want to get some rest today so you can gear up for Ellen's Black Friday through Cyber Monday specials that begin at midnight PST TONIGHT!! You can read all about that sale and specials on the home page of the store! I hope you are enjoying the holiday with family and/or friends ... I am! And I'm truly thankful for each and every one of you who visit here! Happy Thanksgiving! Let me tell you what a joy it is to receive Taylored Expressions' Key Ingredients Kits each month! These kits make it SO easy to have all the perfectly coordinated ... well, KEY ingredients!, at your fingertips for quick and easy crafting! Cardstock, the latest and greatest patterned paper, beautiful ribbon, and color-coordinated embellishments. And for just $21.95 per month (6-month subscription) you can, too! This month, half of Taylored Expressions' Baker's Dozen designers were challenged to create Thanksgiving themed projects with family traditions in mind, with the November Kit. Here's what I came up with -- a photo frame! I don't know a family that doesn't take a lot of photos when everyone is gathered during the holidays. I'm usually the one taking photos of everyone else and it's been way too long since we had a photo taken together as a whole family. So this Thanksgiving I'm going to make it a point that someone take our picture together and then it will be placed in this frame! I adore the rich jewel tones in these papers (although my camera seems to be having some difficulty showing you just how pretty these colors REALLY are together!) included in the November kit (Basic Grey Indian Summer), so I decoupaged them onto a $1 wood frame from Michael's which will hold a 4"x6" photo. Then I painted the edges of the frame with a rich espresso metallic paint. I was immediately drawn to this large wine colored rick-rack in the kit and knew I wanted to use it with the fabulous Kaiser wine colored rhinestones (also included in the kit) -- a perfect match! Showing you a plain frame just wasn't acceptable so until I can get that new family photo taken, I quickly stamped this piece to put inside the frame. I stamped the large dandelion from Taylored Expressions' Celebrate Life stamp set in Memento Rich Cocoa ink onto Desert Coral Dark Prism cardstock from the kit. The "Give thanks" sentiment is also from the same set -- I stamped it inside the frame from Luxurious Labels onto TE Choice Buttercream cardstock. Then I added the small dandelions from Luxurious Labels in Memento Potter's Clay ink (giving them some sparkle with Copper Stickles!). The label was cut out and popped up on Taylored Expressions' foam tape. Tucked behind the label frame are some fabulous jewel-toned skeleton leaves included in the kit ... a perfect three-dimensional accent! As you can see, the Key Ingredient Kits are not just for cards -- you can also use all the elements for scrapbooking, gifts, or three dimensional altered items! To see more great projects today using this kit, you can visit these Baker's Dozen designers: Taylor VanBruggen, Laura Fredrickson, Sharon Harnist (<=You're here! ), Charmaine Ikach, Karen Giron, Jodi Collins, Donna Baker. And I hope you have a wonderful weekend! It's Weekend Sketch Challenge time again! Our 4th grade teacher's birthday is over Thanksgiving break next week, so we're sending this card to her today. This great new Report Card 8" paper pad by October Afternoon was the perfect choice for her card, I thought! (And I see StarLitStudio has it on sale right now!). I combined the paper with sentiments from Papertrey Ink and Karen Lockhart's Itty Bitty Apple and Itty Bitty Ruler. I combined the Itty Bitty images together onto an Inchie Arts Ivory Inchie Square. I'm LOVING these new neutral Inchie Squares and the ivory matched the patterned papers perfectly! I colored the Inchie Square with the Copic markers pictured above. The strangely labeled YR31 is my custom lighter marker that I made by diluting Copic YR31Various Ink Refill (one part) with two parts Colorless Blender solution. One corner of the Inchie Square was rounded with Zutter's Round-It-All corner rounder -- this thing chomps through the Inchie Square matboard like butter! The Inchie was then layered onto a scalloped punch and popped up on foam tape. You can find more samples using this sketch today by visiting the sketch team's blogs: Beate, Cambria, Charmaine, Jenn, Lori and Mary Jo. We hope you'll try it, too! I'll be back in just a few hours with Taylored Expressions' November Key Ingredients Kit challenge between the Baker's Dozen designers! 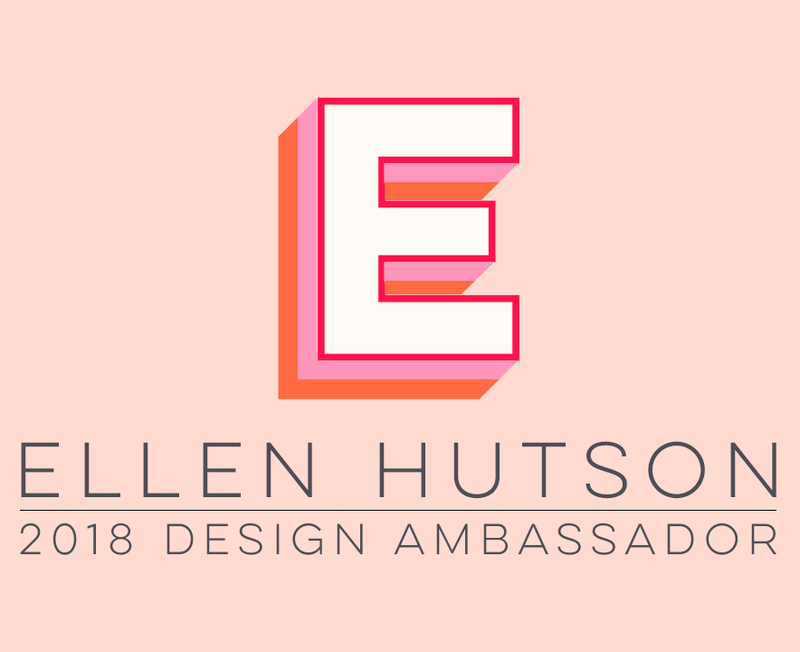 This month Ellen Hutson LLC is celebrating 3 years in business and over at her CLASSroom blog we are focusing on simplifying life; celebrating our gifts, strengths and family; and gratitude for all those things. Today over at the CLASSroom, I've made a thankful tag book that will become a family treasure to share year after year ... I hope you'll join me there to find out how to make it! And don't forget about the celebratory anniversary sale Ellen has going on at the store this week -- 15% off everything until this Saturday, November 21. You can find all the details on the home page ... happy shopping! Here's my December 6-inch calendar page a little early! I adore this sweet bird image from Taylored Expressions' Wings of Joy stamp set, so I paired it with Cosmo Cricket's cute mitten and hat paper that compliment it perfectly! It was stamped directly onto Taylored Expressions' Calendar page. I cut a Spellbinders snowflake out of Prism Intense Pink (available in Taylored Expressions' Christmas Key Ingredients Kit) and white cardstocks, stacked them together on foam tape and then glitterfied it! A Zva crystal adorns the center. A piece of red-stitched pink ribbon (again, from the Christmas Key Ingredients Kit) and tiny pink snowflakes made with a Martha Stewart edger punch finishes it off! Thanks for visiting today ... Are YOU looking forward to December?!! Accessories: Taylored Expressions 2009 Calendars (2010 calendar now available as a download), Martha Stewart Snowflake Edger Punch, Crystal Ice Stickles, ribbon from TE Christmas Key Ingredients Kit, Zva crystal, foam tape, corner rounder, Spellbinders Snowflake Wonder die set. JustRite Hip to be Square Blog Hop! Welcome to JustRite Stampers' - November release Blog Hop! JustRite has some fantastic new monogramming options for you, as well as a great new Custom Design Cardmaking Kit! This 1-5/8" round sentiment set is perfect for any kind of cardmaking occasion you might have and all these new stamp sets are now available for ordering from the JustRite site! I chose to use the new Decorative Frames Borders-Square to frame letters to spell out a whole word, instead of just framing a single monogram. So think outside the box with these pretty new frames -- they can be used for a number of things besides just monogramming! These frames and 2-inch Square Wood Stamper can be purchased separately and used with any fonts you may already have OR purchased as the Deluxe Square Monogram Kit, with the Special Occasions font set included. For my project, I found some 3-inch wood blocks (on which the J and Y monograms are attached) at Hobby Lobby on half-price clearance (gotta love those sales!). There were 7 blocks in fall colors that originally spelled out HARVEST. I just used two of the blocks, repainted them, and decoupaged some of my favorite older BasicGrey papers to them. The center block was found at Michael's in the dollar bin, was unpainted wood, and already had the photo holders attached! I thought my new JOY set would make a nice mantle or table decoration to display either photos or some favorite Christmas cards this holiday season! I inked up two of the different decorative frames you get in this set with green ink and stamped them onto a brand new Inchie Arts product -- Twinchie Squares! They are 2-inches square (still made from the best museum-quality fine matboard as original 1-inch Inchie Squares) and fit these new 2-inch JustRite frame stamps perfectly! To get a perfectly placed impression, turn the wood stamper over so the stamp images are face up, and then place the Twinchie Square onto the inked stamp. I used the Ivory squares from the Neutral set. Then I inked the monogram letters with red ink and stamped them onto Inchie Arts' Inchie Squares (again, ivory from the neutral set). Each of the Inchie and Twinchie squares were outlined with either YG95 or R39 Copic marker, to help accent them, and then adhered in place on the front of the blocks. To visit the other bloggers on the hop and see more fabulous projects, start off at the JustRite Blog, then Barb Schram, Debbie Olson, Heidi Blankenship, Kathy Jones, Kellie Fortin, Angela Barkhouse, Lauren Meader, Lisa Somerville, Michele Kovack, Michelle Wooderson, Sharon Harnist <==You are here! and Sharon Johnson. Enjoy! Before I announce the winner of my Copic giveaway, I totally forgot to give you all some good news last week (if you haven't already seen it): Those fabulous new JustRite SQUARE stampers and 8 other new products in the November release are now shipping! You can find them all at the JustRite site, HERE. And there's a big JustRite sale going on ... 20% off every Christmas stamp set!! You can find all the sets listed HERE at the JustRite site. There have also been some new items added to the Super Sale Section of the website HERE. Whole stamp sets and supplies priced from just $2 to $5 ... What wonderful Christmas presents these will make! Be sure to mark your calendar for this Tuesday, November 17 when the JustRite Design Team will be showcasing the new November release with a blog hop. I'll see you then! Now on to our Copic winner . . .
Robyn said ... I have just started using copics and I really love the rich, vibrant colors. I enjoy learning new techniques. Now, I just need more markers - I only have 7. Congratulations, Robyn, it looks like some more Copic markers (or maybe the ABS?!!) will be headed your way! I've sent you an email -- if you don't see it, please email me your mailing info, using the link under my photo. Today over at the CLASSroom I have a holiday project to share with you ... are you ready for the countdown to Christmas?!! My house now is! I wanted to make an advent calendar last year but ran out of time before the holiday season hit, so I'm glad I started early this year and got it done! I hope you'll join me there to get the full details. If you are looking for my Copic giveaway post (<= you can click right there) or it is located right after this one. You have until this Saturday night to enter for the chance to win the Copic product of your choice (shown below)! Tomorrow is Weekend Sketch time and I'll be back with a project for it! Here are those Copic announcements I promised you last week! Let me begin by saying that if you are a newcomer to my blog, you can find all the information I've compiled about Copic products, including links to tutorials, chart downloads and my favorite color combinations, on my Copic Info page (link is directly under my blog banner). It is with great excitement Copic is announcing the addition of some fabulous new designers and instructors in 2010 to the Copic Team! New team members will be effective as of December 1, 2009. So yes, this means I’ll finally be teaching some Copic Certification classes, mainly close to home in Texas. I’ll be assisting Sally Lynn in San Antonio on December 13-14, so I look forward to seeing you there, if you're attending. (Both classes are still open to Stores & Designers). And hope to get a class scheduled in the Dallas/Ft. Worth area around Feb-Mar 2010, so keep an eye out here on my blog for that announcement! And I'll also be demonstrating at the Copic booth at CHA in Anaheim in January so if you are there, please stop by and say hello! If you are interested in receiving information about any upcoming Certification classes in your area, you can sign up at Marianne’s blog (large green box on her right sidebar). or any 12 Sketch Colors!! 1. One winner from each blog will be randomly chosen. 2. In addition, Copic will be reading through comments as well. If they find a testimonial they really like, they will contact that person to use their story for their CHA booth. You would then be given an equal prize to the random winners! So make your comments good! There will be 2 or 3 “comment” winners chosen total. These will not be announced right away (please give us a little time to read through all your comments!). Only one comment per person, per blog, please. I will be taking entries here on my blog until this Saturday, November 14 at 10pm CST, at which time I'll let Random.org choose the winning number and post the result on Sunday. I can’t wait to hear what you all have to say about your Copic products … Good Luck!! EDITED: COMMENTS ON THIS POST ARE NOW CLOSED AND THE WINNER WILL BE ANNOUNCED SHORTLY. THANKS FOR ENTERING! I've been a bad blogger this week and have neglected to mention some wonderful blog candy that's up for grabs over at the JustRite blog. They are introducing the November release of new stamps AND have daily blog candy prize drawings! You still have time to enter into a few of the drawings, so be sure not to miss that! On to Beate's Weekend Sketch Challenge #105 (sorry I'm a little bit late today!) ... I was feeling a bit in the Christmas spirit and hadn't used these darling JustRite snowpeople from the Old Fashioned Christmas Set yet, so I decided to give them some inky love! What started out as a card ended up as a holiday door hanger for my girls ...thus, all the pink I have going on here! I used Craft-a-Board for a 6-inch base behind the Basic Grey paper, to give some sturdiness, and cut a hole in it for the party favor's bubble to pop through. The favor is a clamshell -- the snowpeople are glued to the inside flat back of it. I found some pink & red cute little pompette trim in my stash (Beaux Regards from sweet Cindy's StarLitStudio store) that matched perfectly and then larger pom-pom trim was added to the bottom edge and looped at the top, to make the hanger. The only pink buttons I had were a little too light for my preference (see them closest to my Copic Airbrush System in the photo above), so I airbrushed them with the same Copic R85 I used to color the snowlady. Since the snow inside my shaker would have covered up the lower portion of the JustRite border for this 3.25" round stamp, I decided to leave it off the main image and just cut it up and used over on the lower right! You can find more samples of this sketch by visiting these fabulous ladies: Beate, Cambria, Charmaine, Jenn, Lori and Mary Jo. I hope you have a wonderful weekend and can play along with this sketch! And don't forget to check out that JustRite blog candy giveaway! !